A very fashionable and elegant derby cane. 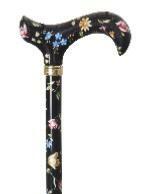 The cane is patterned both on the supportive, elegantly shaped derby handle and on the aluminium shaft. The cane is patterned both on the supportive derby handle and on the aluminium shaft.